If you would like to make an enquiry about staying at Brookby Motel, please don't hesitate to contact us. We offer five self-contained units: 4 x 1-bedroom units and 1 studio units. Tastefully decorated, exceptionally clean and with all the comforts of home. Have a cuppa on the balcony overlooking the brook, relax watching 50+ channel SKY TV or keep in contact via free WiFi. Thames is steeped in early settler and gold mining history. Predominantly that of a gold-mining town from the 1860s to 1920s, many relics of that time are still visible today. The owners' home at Brookby was built in 1890. Thames is ideally situated as a holiday base as it is the main commercial capital of 'The Coromandel Peninsula'. People come from all around the region every Saturday morning for the Thames markets. Thames Golf Course is a pleasant 18-hole challenge for an afternoons activity. 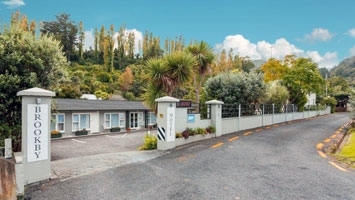 For your security and peace of mind Brookby Motel is protected by 24-hour recorded video surveillance of the grounds to ensure the safety of guests and their belongings.